As the nights begin to draw in, Night King Pro’s LED Bike Lights are set to help more cyclists than ever stay safe thanks to their premium features and ease of use. Boulder, Colorado, United States - September 9, 2016 /MarketersMedia/ — Cyclists have had a wonderful summer to enjoy getting out and about on their bikes, and have enjoyed carefree commuting during the long summer evenings. As fall approaches however, the nights are beginning to draw in, and individuals will have to start taking measures to improve their visibility on the road. Fortunately, Night King Pro sell some of the best bike lights on Amazon, with an emphasis on user friendly design. These lights have been prepared to help more cyclists than ever stay safe on the roads this winter. The lights are designed to be as easy to use as possible, outfitted with premium features. Their anodized aircraft grade housing and o-ring seal make the lights the most durable and waterproof in the market, while the super bright LEDs offer the best luminance with long battery life. What’s more, the housing has been contoured to offer wide-angle lighting options so ensure visibility from the side, while individuals can simply press the light for constant beam, flashing light or to turn it off. The high quality rubber straps mean the lights can be affixed to any bike in seconds, and removed just as quickly. About Night King Pro: Night King Pro design and manufacturer affordable, high quality bike lights designed to help keep cyclists safe at night while providing the best and most comfortable experience for the user. 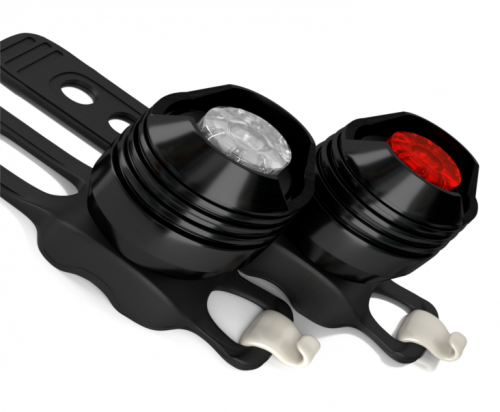 These bike lights offer easy mounting, variable beam, long battery life and super bright LEDs.